Leading South Australian events and music identity BRIAN GLEESON OAM and iconic South Australian venue, ADELAIDE OVAL, are the newest inductees into the AMC South Australian Music Hall Of Fame. Both were inducted into the AMC South Australian Music Hall Of Fame today in a presentation held at Adelaide Oval. Brian Gleeson’s career in the South Australian music industry has been acknowledged with the announcement that he is the Hall Of Fame’s 100th individual inductee. Adelaide Oval is the 6th and largest venue to date to join the inductee list. The South Australian Music Hall Of Fame was founded by Adelaide radio legend David ‘Daisy’ Day who had a personal collection of over 40 years worth of memorabilia, some of which is currently displayed at St. Paul’s Creative Centre in Adelaide’s CBD. The AMC South Australian Music Hall Of Fame celebrates the careers of successful music industry identities and creates relationships with upcoming musicians, the future of South Australian music. The first individual induction took place in March 2014. In December 2016, the Hall Of Fame expanded to inducting venues with the support of Ian Horne and the Australian Hotels Association. David Day’s inception of the South Australian Music Hall Of Fame came through conversations had with fellow Adelaide DJ, John Vincent. John passed away in 2009 and Daisy in 2015. Their shared passion and dream is carried on today and their faces don the medallions awarded to each inductee, many of whom they helped and worked with, and played a part in establishing their music careers. (AMC) The Adelaide Music Collective is a collective of Adelaide artists/associated professionals with national and international experience in the music industry. It was formed in late 2013 by Enrico Mick Morena and at the request of Daisy, took on the custodianship of the South Australian Music Hall Of Fame in early 2014. The AMC is overseen by a committee and operates to assist each other by encouragement, cooperation and facilitating access to knowledge and resources. Brian Gleeson originally started his career in music as a drummer with various Adelaide bands including Elfin Glade, followed by popular party band Shamrock. Whilst drumming for Shamrock, Brian also looked after the band’s bookings, production and crew. After leaving the band Brian was later approached by Shamrock to handle their personal management and bookings, which led to the launch of Brian Gleeson Management. Brian’s management company quickly became the home of Adelaide’s premier acts including The Zep Boys, Session/China White, John Rundle and The Maulers, Counterfeit, Vertical Hold and many more. With the rising success of his management company Brian formed an agency, Adelaide Rock Exchange, which became the one-stop entertainment company for South Australian bands and venues. After many years at the helm of the hugely successful agency, in 1995 Brian sold the agency and moved into events and concert management. In the same year, while working on the Australian Formula One Grand Prix in Adelaide Brian in collaboration with promoter Michael Gudinski, secured US supergroup Bon Jovi to perform at the Adelaide Grand Prix Grand Finale. It was the very last Grand Prix race to be held in Adelaide and attracted the biggest crowd ever to attend an Australian motorsport event. In 1999, Brian commenced working on South Australia’s iconic Clipsal 500 (now known as Adelaide 500), in the role of Event and Concert Manager. Over the many years of the hugely popular concerts, Brian secured a star-studded list including: Powderfinger, Silverchair, The Angels, Jimmy Barnes, Cold Chisel, INXS, Guy Sebastian, Lee Kernaghan, Hoodoo Gurus, The Living End, Wolfmother, Noiseworks, Keith Urban, Empire of The Sun, Kimbra, Vanessa Amorosi, Ruby Rose, Reece Mastin, The Black Sorrows, Vika & Linda Bull, Boom Crash Opera, Bliss N Eso, Zoe Badwi, Sneaky Sound System, The Potbelleez, Icehouse, Peking Duk, The Church, Havana Brown, Hilltop Hoods, Hunters and Collectors, Baby Animals and Pete Murray; along with international artists including Good Charlotte, KISS, Motley Crue, Santana, Doobie Brothers and Status Quo. The recent 2018 Adelaide 500 concert series featured headliners Robbie Williams and +LIVE+, with the 20th Anniversary Made In SA concert featuring Cold Chisel, Kasey Chambers, and Bad//Dreems. In 2011, Brian took a concept called Bands On Track to Music SA which would give local South Australian acts the chance to perform on the concert stage at the Adelaide 500. Opening for the headline acts, Brian wanted to offer local musicians and their crew valuable exposure and experience in front of large audiences. The Bands On Track program facilitated by Music SA, provides the opportunity for two local acts to perform each concert night. Since 2011, 43 local South Australian acts have performed on the concert stage. Amongst the other ‘firsts’ throughout Brian’s career, was the coordination of the first ever concert at the newly opened Adelaide Entertainment Centre in 1991. The ‘Kick Start Concert’ featured headliner John Farnham, an array of popular South Australian artists, and, Brian Gleeson on drums as part of John Vincent’s Ken Oath Ockestra. In 2014, Brian was tasked with putting together the very first concert at the redeveloped Adelaide Oval. Tony Cochrane and Michael Gudinski asked Brian to coordinate a concert by The Rolling Stones in a venue still being built. Brian was invited to meet Sir Mick Jagger at his hotel for a cup of tea made by Sir Mick himself! In 2013, Brian was awarded the Order of Australia Medal (OAM) for services to the community of South Australia through the management of sporting events. Having the opportunity to work on the Adelaide 500 has seen a long-term commitment and dedication to the event for Brian, who continues to strive towards delivering a great experience for patrons and attracting high profile acts to perform at the concert series. As has always been the case throughout his entire career in the South Australian music industry, supporting and encouraging the development and exposure of local acts continues to be a passion. During the past 40 years, Adelaide Oval has hosted a wide range of live music events starring some of the world’s biggest performers. 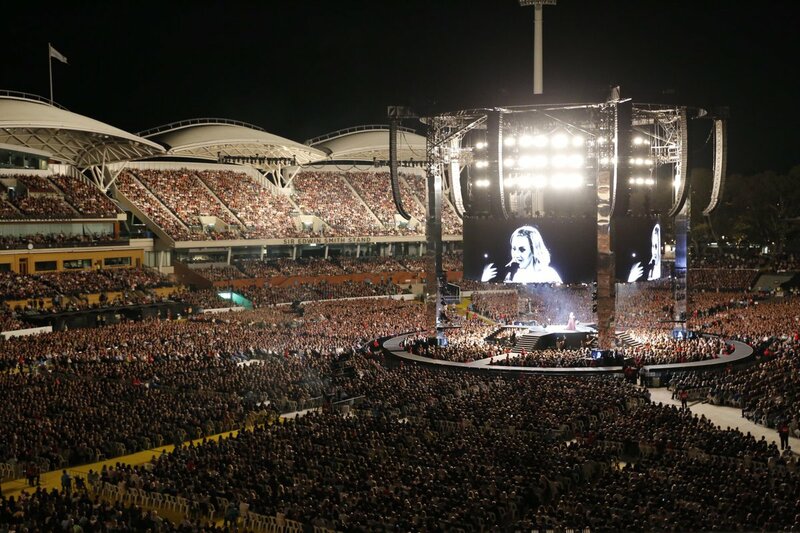 From the first concert hosted in 1977 (Little River Band) to the record-breaking Adele concert in 2017, Adelaide Oval is a world-class venue capable of hosting globally renowned acts. Since its redevelopment in 2014, the internationally awarded venue has proven its flexibility by hosting full-house concerts right through to small and intimate private functions. In fact, Adelaide Oval is a significant contributor to the live music industry with bands performing at private events within the venue week in, week out. “Adelaide Oval is absolutely delighted to be inducted into the AMC South Australian Music Hall Of Fame. This recognition not only acknowledges the major concerts staged at Adelaide Oval over the years, but also recognises the important support Adelaide Oval provides to the live music industry in this State as part of our Functions and Events business,” Adelaide Oval SMA CEO Andrew Daniels said. The AMC South Australian Music Hall Of Fame committee and members congratulate Brian Gleeson OAM and Adelaide Oval on their inductions today.